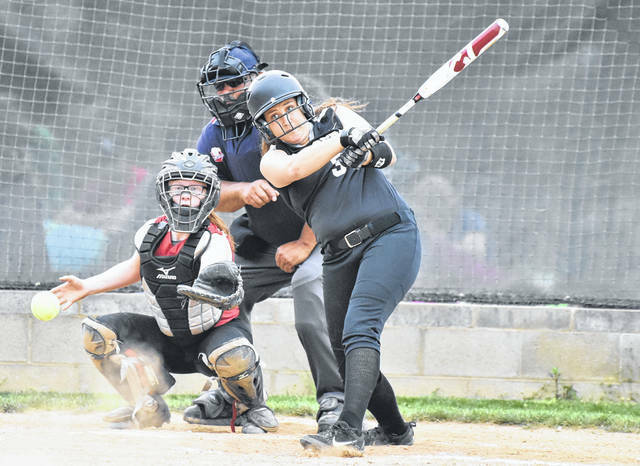 RVHS sophomore Kasey Birchfield drives a ball up the middle during the Lady Raiders 15-1 victory over South Gallia on Friday night in Bidwell, Ohio. BIDWELL, Ohio — Hits by the dozen. 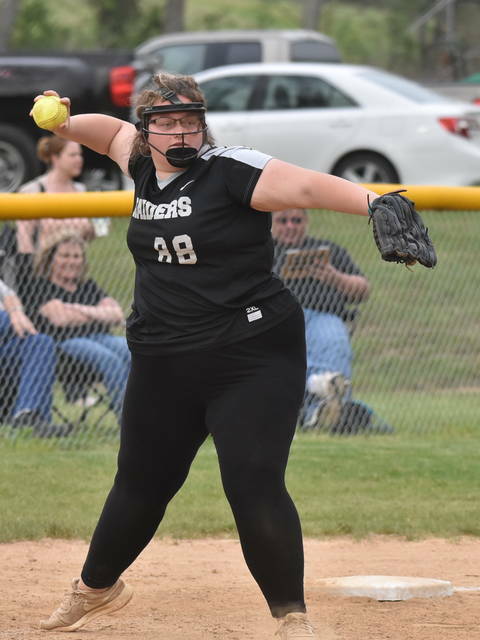 The River Valley softball team combined for 12 hits on Friday night, en route to a 15-1 victory over the visiting Lady Rebels in a contest between Gallia County rivals. The Lady Raiders (6-9) surged to a 3-0 advantage in the first, as they manufactured three runs on two hits and three walks in the inning. The Silver and Black tacked on six additional runs in the second, as Sierra Somerville, Cierra Roberts, Isabella Mershon, Arika Barr, Kasey Birchfield and Chloe Gee each scored in the frame to extend the lead to 9-0. 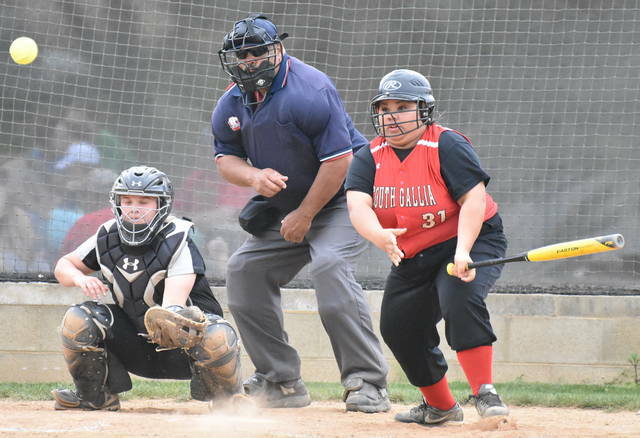 RVHS added five runs in the third — highlighted by a two-run home run by Baylee Hollanbaugh —to further its advantage to 14-0. The Lady Raiders pushed their lead to 15-0 in the fourth, when Mershon reached on a two-out single and scored on a single by Barr. The Lady Rebels (6-14) cut the deficit to 15-1 in the top of the fifth, as they manufactured on one hit and a fielding miscue by the hosts. River Valley however prevented any further runs in the frame to close out the 14-run victory in five innings. Barr was the winning pitcher of record for RVHS, as she allowed no runs, one hit, one walk, while striking out four hitters in two innings of work. Somerville provided two innings of relief, surrendering no runs, no hits and four strikeouts. Mershon also pitched one inning of relief, allowing one run on one hit. Birchfield led the Lady Raiders at the plate, as she collected three hits, scored twice and drove in three runs. Gee, Barr and Mershon followed with two safeties apiece, while Somerville, Hollanbaugh and Kaylee Tucker each provided one hit. Barr scored three runs, while Somerville and Roberts scored twice apiece, respectively. Hollanbaugh and Gee also were driven in one time each in the contest. Barr also finished with three RBI, while Hollanbaugh, Mershon, Gee and Tucker drove in two runs apiece, respectively, to conclude the offensive totals for the Silver and Black. Makayla Waugh suffered the loss for SGHS, as she surrendered 15 runs on 12 hits, with six walks and seven strikeouts in four innings of work. Waugh delivered a total of 122 pitches and faced 25 hitters in the contest. Savannah St. Clair and Emily Mandeville each had one safety apiece to conclude the hit totals for South Gallia. 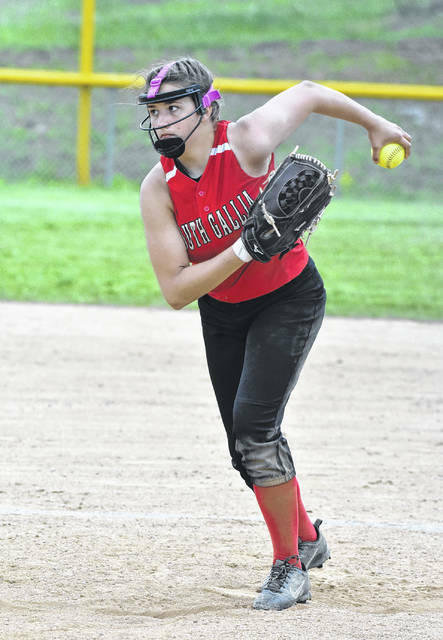 River Valley committed one fielding miscue in the game, while South Gallia had three errors. RVHS stranded five runners, while SGHS left three on base. The game served as the final regular season home game for the Lady Raiders, who celebrated senior night recognizing their lone senior member Isabella Mershon. Following the game, RVHS coach Nick Roberts was pleased with his team’s performance — particularly with providing a winning send-off. The contest also served as the final regular season game for South Gallia seniors Keirsten Howell, Olivia Hornsby, Brooke Campbell and Destiny Johnson. Following the game, SGHS coach Sarah Shirley elaborated on the leadership provided by the four departing senior athletes. “They are a great group of kids,” said Shirley. “They’ve played hard and hustled for me all four years they’ve played for me. They’ve done everything they can to help build a program. Thanks to that type of leadership we are starting to get some softball knowledge to the youth on our team and we are coming along.